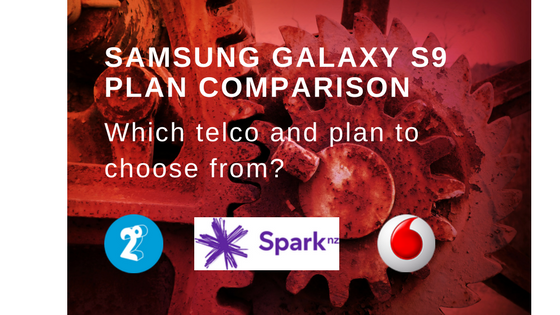 Most consumers that purchase a Samsung Galaxy S9 or S9+ phone need an accompanying plan from a telco. PriceMe Consumer has compared the plans from the three major telcos in New Zealand: Spark, Vodafone and 2 Degrees. It’s a little bit tricky to compare plans side-by-side since certain parameters like monthly data allowance and minutes calling vary. The Samsung Galaxy S9 phone used in the comparison has 64 GB of storage. The open plan implies that one purchases the phone and pays over a 24 months period, but that the plan duration is flexible. Table 1. Comparison of open mobile plans for Samsung Galaxy S9 with 64GB storage. Many consumers opt for a time-limited plan and the most popular plan is the 24 months plan. Table 2 compares the plans side-by-side. Table 2. 24 months plan for Samsung Galaxy S9. The open plans for Samsung Galaxy S9+ are shown in Table 3 below. Table 3. Open plans for Samsung Galaxy S9 Plus with 64 GB of storage. The best deal for an open plan is 2Degrees for the S9 phone assuming that one calls less than 400 minutes per month. Vodafone offers the best 24 months plan in our opinion due to low total cost and 22 GB of monthly data. We would also pick Vodafone for the S9+ open plan, especially if one calls less than 300 minutes per month.